The National Childrens’ Museum (due to open at National Harbor in 2013) is opening up a 2,700 square-foot Launch Zone at National Harbor this weekend. They’re doing some big events this weekend, running from 11 to 4 both days this weekend. Saturday will feature a recycling-related theme, with performances of Willy the Water Bottle, and Sunday will feature the Washington Revels in a special performance of Sea Revels. All events are free and open to the public! This is absolutely perfect for me and my family. Today we were about to go to the zoo. But due to the heat yesterday, I would hate to be outside all day. So if it is balanced, that would be fine. With my father-in-law in town, a water taxi and day at the National Harbor with out 10-month-old would be a great time, especially since the National Children’s Museum is opening a demo space. This could be great. I will try to get some pictures with my Nikon D60. 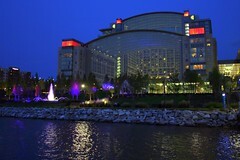 So, we did end up going to the National Harbor this weekend, me and my family. The good news is that it is so tremendously beautiful there with great art in just about every direction that it is worth a visit. The bad news is that it is skeletal at best. There isn’t much to do besides look around for a little bit and eat. I ended up eating at Potbelly’s. I had the Pizza Sandwich. We took a water taxi from Old Town Alexandria, but it cost $16 for a round trip for one person (quite expensive for a 15 minute ride each way, but worth it at least once for the experience) and they played a video about Alexandria geared for tourists on the way back. We went over to the National Children’s Museum demo space and it was really a couple of boards describing what the museum would look like. It will be a green building, optimizing energy needs and other resources. Other than that it was a major arts and crafts session. Not much more. There was a guy who was really great at making balloon shapes (super soakers and hats, etc). It was really hot today, so that drained all of the energy of everyone in my party. My 10-month-old daughter also got sick from the heat and we had to cool her off with an ice pack that we brought with us. If you go, don’t forget your sunscreen during the hot summer months. I wouldn’t recommend more than an hour stay, but like I said, it is worth seeing for its beauty and picturesque scenery at least once.